1) I think the slot we have today, on the ocean side, is OK.... but i don't think its throughout the entire migration path, from VA, up to Maine... that would be a nice change. I think that making it a game fish status (C&R only) will get blocked all day long, although that is the best option if you want to protect the stock. 2) the comms need to go away, period, or gill nets (any netting)... DE just increased its gill netting % of all commercial from 90% to 95%... because the commercial guys where not catching anything on hook and line (GO FIGURE right) which went from 10% to 5% of total... so now they basically increased their yearly quota by 5%. 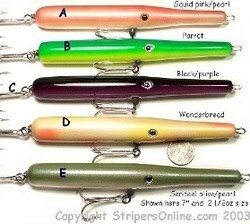 EDIT - this is just for striped bass, not all fish for DE. Really ticks me off when i hear its not the Comms, its all the REC that's the issue.... both are the issue, but REC, you have a choice to C&R. Gill nets just kill everything, and comms have proven time and time again they don't give a crap, and will just dump dead fish. If every REC angler was just throwing whatever they caught up on the sand/rocks/deck and left it there to die just because... think of the uproar. I think ASMFC findings in February may show it is overfished from some chatter I've seen on here from recent NE meetings. I blame recs just as much, you should see how ignorant they are in the chesapeake bay area when it comes to the declining biomass. Give them good hard data and they still reject it. Every one of them makes the excuse that the fish they keep dont impact the fishery. Eastern shore watermen, they are all pricks, plain and simple. The fishery is doomed, just depends how soon it crashes but I'm sure it will. ...keep in mind that charters and head boats, in my mind, are closer to the 'commercial' side than the recreational side. I see recreational as most of us, and those that have their own assets (boat, kayak, etc) and fish for sport, and don't make $ off of the process. There are some charters that do fall into the recreational side as well. Fished behind OC today for a few hours with the kayak. I wasn't able to get out until midday and just about when I got out, the wind started to pickup. 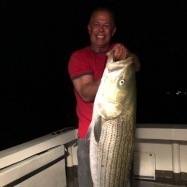 I stuck it out for a few hours, but had to grind just to get a few schoolies up to 20". It started to be more work than it was worth so I packed it in a little early. I think it's better fishing back there in the dark anyway. Since I still had some more time to fish if I wanted too, I crossed over to the beach to give it a look. I spent about an hour walking the beach casting. The water was nice and clean, the beach very steep, and the structure looked half-decent. It looked promising even if I knew in the back of my mind my chances were slim at even finding some rats. But what do you know - I actually got a fish. I guess I'll quit while I'm ahead; 1/1 avoiding the skunk on the beach this fall. They are commercial in the Chesapeake, just hiding under the "recreational badge". They don't do it for the goodness of their heart, they fish for $$$. Granted, there is a smaller percent that guide and truly promote catch and release, but the bulk of them are meat charters for their clients. Also, quite a few supplement the business as pin hookers for their quota under a commercial fishery license when they don't have clients scheduled. exactly. the 'face' of the commercial fishery has changed over time, i don't think may think that way or see that. If you get paid $ to bring home fish, your commercial. I always thought/considered headboats and charters as recreational. The way I see it, yes they are making $ going out but they are not a commercial boat that is selling wholesale on the market, it is still recs who are taking the fish home in the end. When the Striped Bass Amendment 6 passed in 2016, it was stated in the record that these reductions only had a 50% probability success in rebuilding the stock. It appears now that the reductions failed. Arguably the assessment in progress will call for additional reductions, or perhaps it is time for another moratorium, or at least a slot that totally protects the big females. I walked the beach in OC again today after work from late afternoon to dusk. I'd forgotten how much I enjoyed just walking the beach casting with the light tackle gear. I had a few bumps that I wasn't connecting on, so I switched to something smaller and finally figured out they were shad bumping me. Ended up landing 4 or 5 of them. 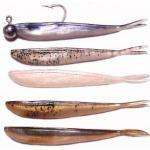 At dusk some small fish started to swirl on some bait right at the shore break and I pulled out 4 tiny stripers of embarrassingly small length, but exceedingly fat in girth.